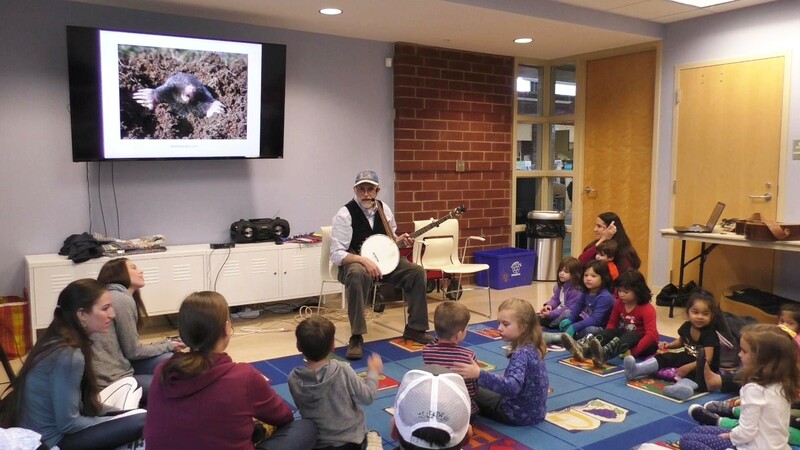 In addition to his many years performing and leading workshops with children of all ages, Jon spent 22 years as a children’s librarian in the Forsyth County Public Library. 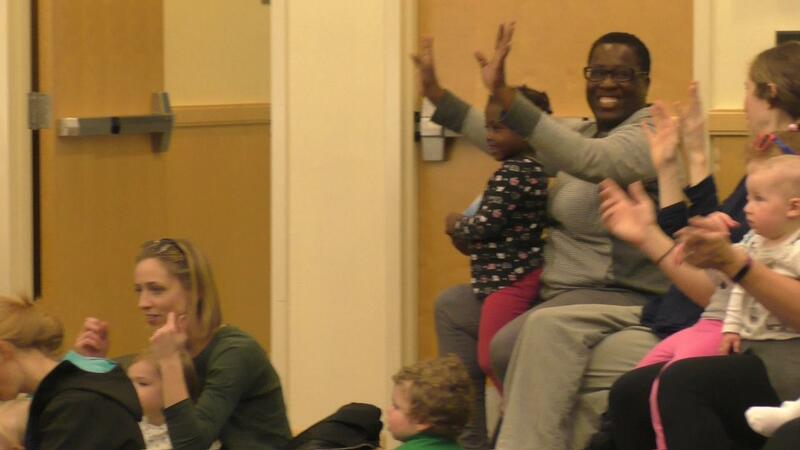 During most of this time he conducted weekly storytimes with toddlers, preschoolers and parents. Over those years he learned to connect and interact with these little ones, and he developed a repertoire of songs and tales to engage and excite them and their parents. Jon uses the banjo and guitar to set a lively pace and rhythm, and the autoharp for a lush melodic change. Songs engage children verbally and physically through call & response, choral refrains, hand motions, and/ or sometimes full body movement. Many of the tales involve children's participation in rhythmic or melodic chants or verses. Jon often gets audience input to create a verse, suggest an animal, vegetable, or other item, or determine the course of a tale. Song & tale excerpts and one "twist-&-tell" story. There is overlap with general children's samplers in numbers 8, 9, 11, & 12. (1) Introductory slide show to studio recording of "My Daddy Rides That Ship in the Sky," by Woody Guthrie, with banjo; (2) "The Green Grass Grew All Around" - call & response song with motions, guitar; (3) "Cleano," by Woody Guthrie, with banjo; (4) "I'm Gonna Tell," by Rosalie Sorrels, with guitar; (5) "The Lion & the Mouse," Aesop's fable with finger puppet; (6) "Love Grows One By One," by Carol Johnson; (7) Story-song version of folktale, "Stone Soup," by Heather Forest, with audience input, guitar; (8) "We're All a Family Under One Sky," by Ruth Pelham, with guitar; (9) "I Wish I Was a Mole in the Ground," mountain folksong, with banjo - children making up new verse; (10) "Twist-&-tell" story, "Solomon, Sheba & the Bee," told while creating balloon flower; (11) "When I First Came to this Land," by Oscar Brand, with autoharp; (12) "En la pulga de San Jose" - Spanish language motion song of playing musical instruments, with guitar. Thank you so much for sharing your talents at our Vacation Church School picnic. Even now children are “making peanut butter.” Your awareness of the wide age range and varied attention spans was remarkable. Watching the children ease forward so they could be a part of the group was wonderful. the creation of 300 multimedia storytime kits and the purchase of a bookmobile to support them in these endeavors. 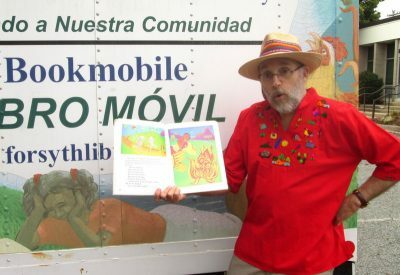 He also purchased a bookmobile for Hispanic Services and developed close ties with Hispanic families, churches, and other institutions, emerging as a national leader in Hispanic outreach among libraries with rapidly expanding Hispanic populations. During his leadership of Hispanic Services Jon conducted many parent training sessions through MotheRead/ FatheRead, a North Carolina program created to increase family literacy. Using a specific selection of picture books, trainers follow a curriculum designed to promote intergenerational dialog and sharing of experiences, while developing an understanding and appreciation of reading. © 2019 Jon Sundell. All Rights Reserved.